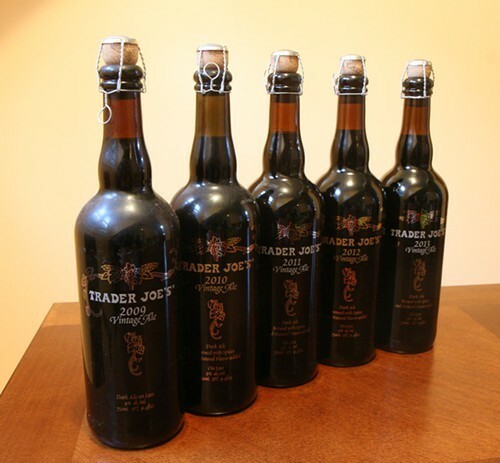 Trader Joe's Vintage Ale: To age or not to age? 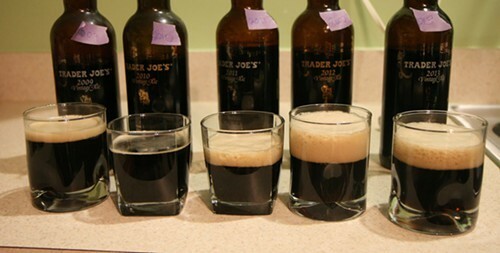 My experiment with aging several bottles of Trader Joe's Vintage Ale began by accident. I'm pretty sure I didn't mean to save the 2009 bottle, I just never got around to drinking it that winter, and it's not really a summer beer. The next winter, I thought it would be interesting to taste the beer that had been aged for a year side by side with the current vintage, but didn't get around to it—though I did manage to save a 2010 bottle. After that, saving bottles became more intentional, but I didn't intend to put off doing a vertical tasting for so long. 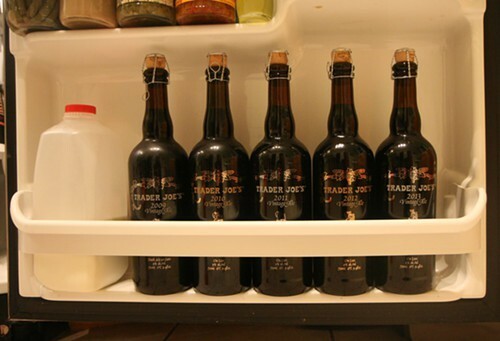 As you acquire more and more bomber bottles of beer that's 9 percent alcohol, though, you need more people to help you taste all those bottles, which requires some organization. Last week I finally managed to round up several friends to help me taste the five bottles I had (2009 to 2013). The beer is brewed by Unibroue exclusively for Trader Joe's and released each fall. A dark ale brewed with spices, it's bottle conditioned, which means that it's bottled with live yeast that consume the sugars and carbonate the beer over time. That makes it a good beer for aging, a fact that Trader Joe's mentions on the bottle, even printing a "best before" date on each one—something I hadn't noticed until this year. As it turns out, you're only supposed to age the Vintage Ale for about three years; my 2009 bottle was supposedly best before September 2012. The 2010 bottle was also slightly out-of-date, but only by a few months—and when you're talking about a three-year-old beer, I can't imagine two or three months make a huge difference. Interestingly, all of the bottles had three-year windows for aging except the 2011, which is supposed to be consumed before July 2016 (I have no idea why). Although the beer isn't identical from year to year, it's pretty similar. I've never tried a particular vintage and thought that it tasted radically different from the others. In general, it's like a Belgian quad but darker, with a molasses sweetness, lots of dark fruit, roasty malt, and spices. It's a good beer, especially for $4.99 a bottle, which is cheap for Unibroue (it's similar to their Trois Pistoles). I was curious to see how aging would change it. All the vintages poured so dark they were nearly black, with a fluffy, persistent head—except for the 2010, which had no foam at all. I also noticed later, when looking at the photos of all five beers together, that the empty space at the top of the bottle was a different color than the other four: a sort of grayish brown instead of reddish brown. And it ended up being everyone's least favorite. I'm guessing that the bottle went bad from being improperly stored (in my old apartment it would get really hot in the summer, and I didn't have any good place to store beer), but it was in the same place as the 2009 vintage and that seemed fine. So who knows. The labels were for the glasses, not the bottles—I didn't want to mix them up. Everyone liked the current vintage, which was subtly sweet and tasted of dates, figs, and milk chocolate. It was effervescent in the same way that champagne is, a product of carbonation produced by the yeast in the bottle; each vintage got progressively flatter, and the 2009 bottle had almost no carbonation (despite having a pretty significant head when it was first poured). My favorites were the 2012 and 2011 vintages. The former tasted sort of like root beer, with more vanilla than the 2013, and was well-balanced and complex in a way that I can't exactly put my finger on. There's a slight harshness to the current vintage that dissipates after a year of aging. The 2011 was even better; it smelled exactly like chocolate and tasted like cream soda. The vanilla in this one was intense, and the beer was sweeter, richer, and creamier than the two younger ones. Two years of aging seems to be the sweet spot: the 2010 and 2009 vintages weren't nearly as good as the others—though that could also be a product of their improper storage. The 2010, like the 2012, tasted like root beer, but it was much sweeter and flatter and the sweetness nearly overwhelmed the other flavors. Although as a friend pointed out, it would be great with ice cream in a beer float. The 2009 was a little more interesting, smelling like figs and tasting of fennel, licorice, and again, root beer. It was the sweetest of the bunch, but seemed more balanced than the 2010 vintage. I came across a podcast from earlier this year on a 2005 Trader Joe's Vintage Ale that had been properly cellared, and the guys reviewing it didn't seem very impressed. I haven't watched the whole thing because it's nearly 15 minutes long, but the tasting notes begin, "Tastes like a bad milk chocolate covered cherry with notes of cough syrup" and end with the conclusion that the beer has been overcellared. So maybe the "best by" date on the back of the bottle is something to actually pay attention to. Last time I was at Trader Joe's they still had plenty of this year's Vintage Ale, but from what I recall it doesn't usually last past the end of December, and they sometimes run out earlier than that. If you want to pick some up for aging (or drinking now), this is probably the time to do it. Julia Thiel writes about booze on Wednesdays.